I hope everyone had a Happy Thanksgiving! Hopefully you enjoyed a delicious turkey, along with many other great dishes, and of course, pie! I made a mini-Thanksgiving dinner a few weeks ago for Friendsgiving, so I wasn’t planning on making a turkey this year. However, some friends decided to not travel home as well, so we all enjoyed a Thanksgiving meal together, and I prepared the turkey. One of my favorite things about making a turkey (or chicken), is being able to use the leftover bones to make homemade stock and soup! If you haven’t tried it before and still have your leftover turkey bones, give this recipe a try. It’s very easy to make and tastes much better than store-bought stock! 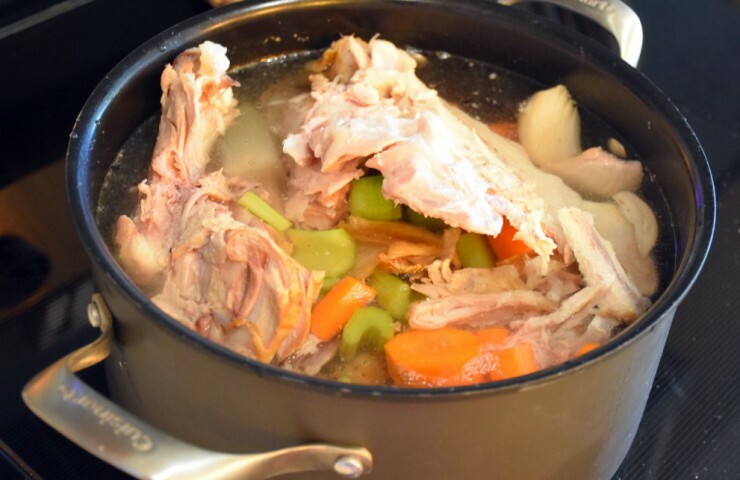 In a large stock pot, add leftover turkey bones, onions, celery and carrots. Pour in enough cold water to cover the ingredients. As you can see, my largest stock pot wasn’t quite big enough to easily fit all the ingredients and completely cover them in water. I broke up the turkey bones and just added as much water as I could; it still turned out great! Bring to a boil, then reduce heat and let simmer for about 2 hours. Periodically skim off any layers of fat that develop on top using a large spoon. After about 2 hours of simmering, use a large colander to transfer the stock to a bowl. 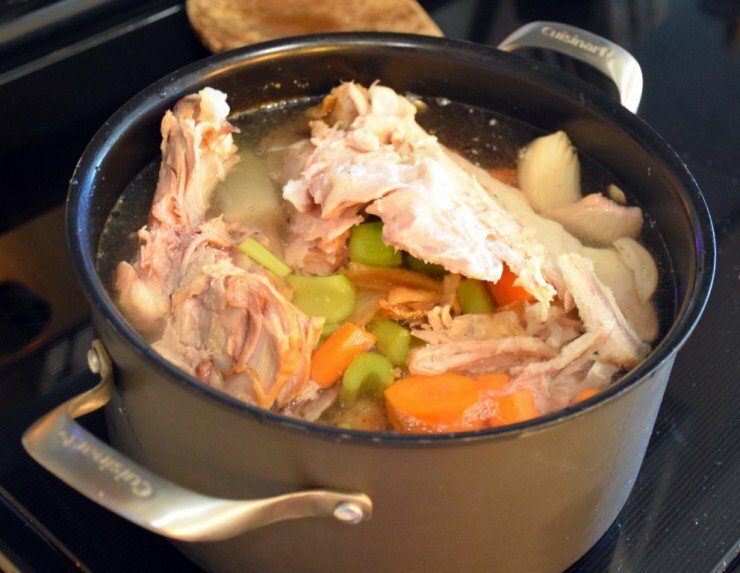 Remove any turkey meat from the bones and save for turkey soup or another use. Discard bones and vegetables. Side note: I also find that food tastes much better when you prepare it wearing Christmas pants. Let the turkey stock cool completely before transferring to the refrigerator. The stock can be stored in the refrigerator for up to 1 week or kept in the freezer for several months. Use the stock to make turkey soup or any of your other favorite recipes! In a large stock pot, add turkey bones, onion, celery and carrots. Add enough cold water to cover the ingredients. Bring to a boil, then reduce heat and simmer for about 2 hours. 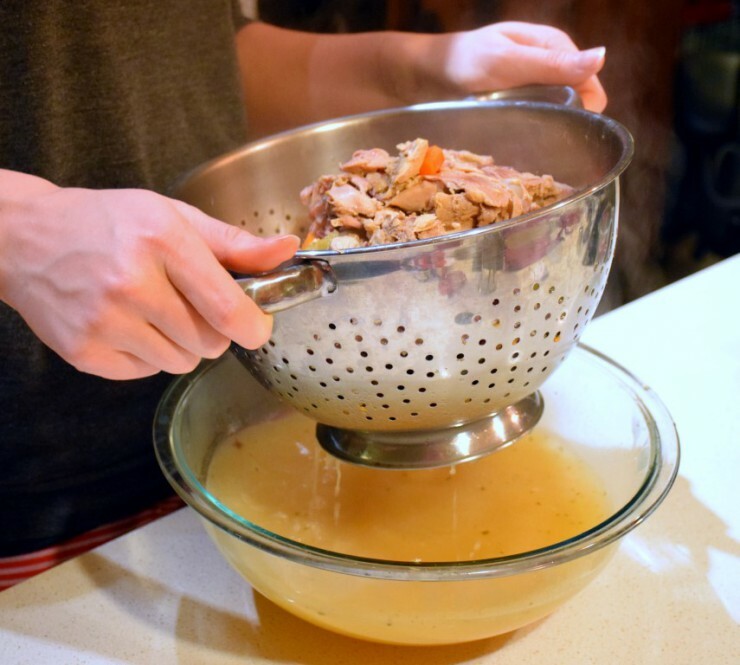 Use a colander to transfer stock to a large bowl. Remove turkey meat from bones and save for a later use. Let stock cool completely before storing in the refrigerator. Stock can be stored in the refrigerator for up to 1 week or stored in the freezer for several months. 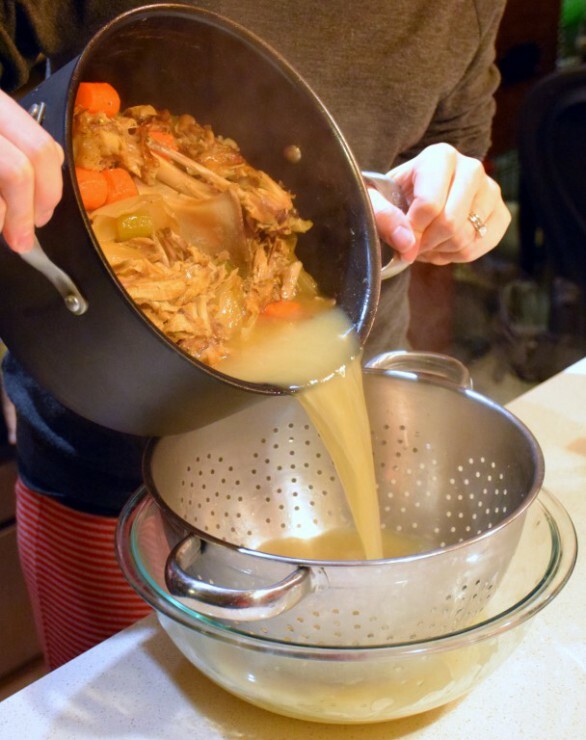 Use stock to make turkey soup or any of your other favorite recipes that call for stock!